Last year when I was attending a number of different MarTech conferences across Canada and the USA, I couldn’t help but notice that there was a major problem with the speaker lineups at many of these events. I felt as though I was surrounded by an overwhelming number of…men. Particularly caucasian men, and I couldn’t help but wonder where all the women were. So I spoke out about it and looked at twelve conferences in the space to see just what the ratio of men to women was on a broader scale. Needless to say, the data was unimpressive. Despite the fact that 51% of advertising and marketing professionals are female, according to the Bureau of Labor Statistics, only 35% of the total number of speakers at these events were women, and the other 65% were men. I’m not even taking into account the lack of racial diversity overall. Other data suggests that 75% of marketing professionals are female, however this was a survey conducted in the UK and only took into account a small sample size, and is a bit dated. As a female person of color, as well as a speaker, I’ll admit that I’m no stranger to rejection. And then I make excuses for myself; maybe I don’t have enough authority, or maybe the topic I pitched wasn’t the right fit, and in some cases, that is the reason for not being selected. However, when I see the rosters of speakers go up, I’m often astounded by the shortage of any form of gender diversity, and sometimes feel stunned by how “white” the lineups are. This year I hoped that I would notice a change. Afterall, it’s 2017, right? And with more and more women speaking out about their experiences in the tech industry, I figured that the awareness of the gender gap would rise. When Susan J. Fowler spoke out and told her story about the experiences she faced at Uber, the realization sunk in that the problem was still very prevalent, and not only about representation but also about the treatment of women. The fact is that women are still not taken seriously or given the respect they deserve in many workplaces. And the reason why it’s so important for women to be given a voice and a spot on stage at conferences in the Tech and Marketing space, is so that they can influence the change that’s needed. Men, and specifically white men, cannot speak for women or for people who are indigenous, black, or people of color (IBPOC). 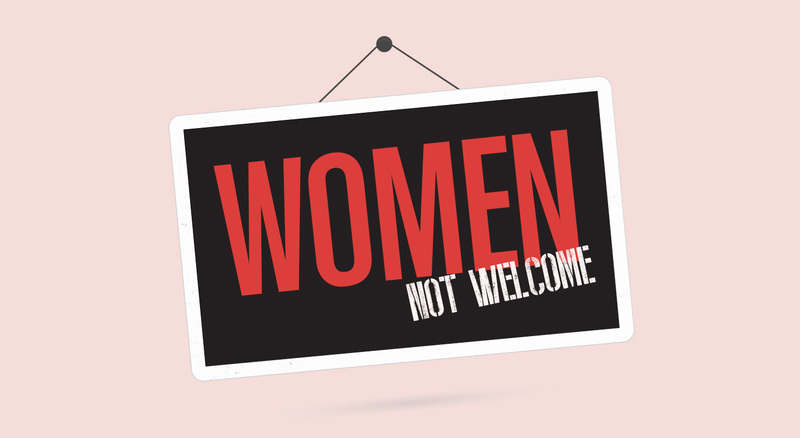 But what they can do is give way to more women and underrepresented groups of people. So this year we decided to look at more than twelve conferences in the industry. We referred to Curata’s list of conferences and analyzed the lineups of 33 events. The overall representation still swayed strongly towards men, who held 63% of stage time. But what I was more interested in seeing was the change that occurred from the conferences that were analyzed last year. Overall, there was actually a drop of 62% in female representation from 2016 to 2017 for some conferences, and an overall increase of 36% for the remaining events. What’s important to note is that the data on the speakers at these events is accurate effective July 18th, 2017. There is still a chance some of these lineups could change (fingers crossed!). It’s evident that there is still a lot of work that needs to be done, however, one thing that I will point out is the increase in Content Marketing World’s lineup of speakers. Last year I called out CMI for not making a considerable enough impact towards diversifying their speakers. The reason I did this was because their conference in question is one of the biggest content marketing conferences in the United States, meaning they are an industry leader with the potential to influence massive change. Joe Pulizzi wrote a compelling piece about tackling diversity in the marketing world. I appreciate that he commented on his own white male privilege and was happy to see a small increase in diversity for this year’s event. That being said, there is still a lot of room for growth. If you’re reading this and struggling to find speakers, I’m happy to direct you towards some fabulous female marketers that can be found in the Women in Content Marketing Group on Facebook (sorry boys, this one is for women and female-identifying individuals only). 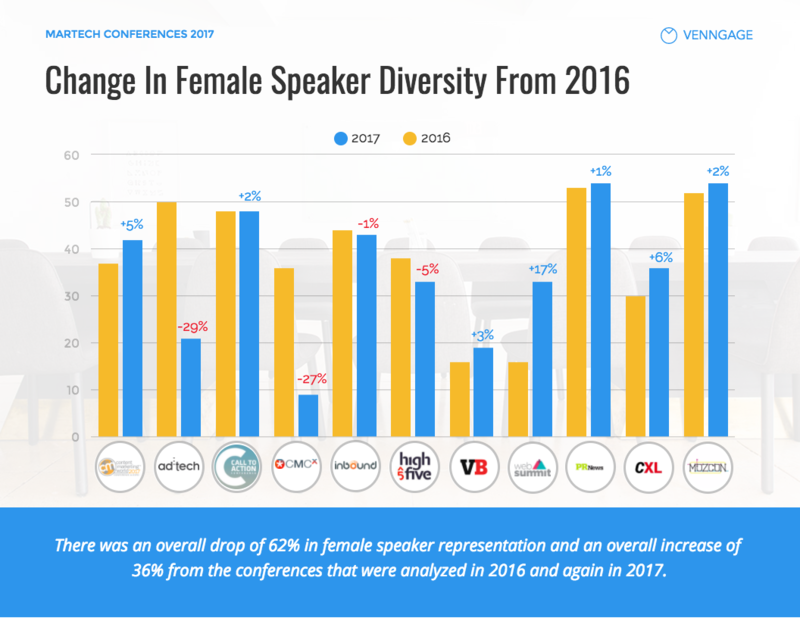 One major decline in gender diversity that shocked me was the Ad:tech conference, which had a 50/50 split last year but only 21% female representation this year. The same goes for the CMCx conference, which had a sad 9% female representation this year. How disappointing. So we know what the change was from the limited conferences that were covered last year but remember how I said we looked at 33 different events for 2017? Spoiler alert! Only 7 out of the 33 conferences had a 50/50 split or greater representation of women speakers than men speakers. In other words, 79% of these conferences have failed to achieve equal gender representation (and this does not consider members of the LGBTQ community either). The truth is (and I’ve said this before) that it’s embarrassing that this is still such a problem. Melanie Ehrenkranz, a reporter at Mic, recently put together a database of 1,000 women in tech that are also speakers. This list can be seen here. It’s up to conference organizers to make a conscious decision to achieve equality but also up to the women, non-binary, gender neutral, trans men and women, etc. who do want to speak to make it known that they are open to the opportunity. You can do this by adding “Speaker” to your Twitter profiles and LinkedIn pages and by continuing to apply to different conferences. I’ve noticed a lot of individuals applauding and congratulating men (who are often white) for their actions towards giving these underrepresented individuals a chance to speak. And although their intentions in congratulating them may be good, at the same time, these actions can add to the problem. Achieving equality is not something anyone deserves a pat on the back for because it’s something that should exist. It’s almost like saying, “Hey! You didn’t murder anyone today. Great job!” We don’t do that because it’s expected of people that they just shouldn’t go around murdering people. I was tagged in a conversation on Twitter a little while ago. One company was working towards creating a database of women in marketing and I was looped into the discussion by someone in my network. Yes, he was a white male. Let me explain a little bit why this is an issue. Again, I assume it wasn’t intentional or they weren’t entirely conscious of what they were doing. 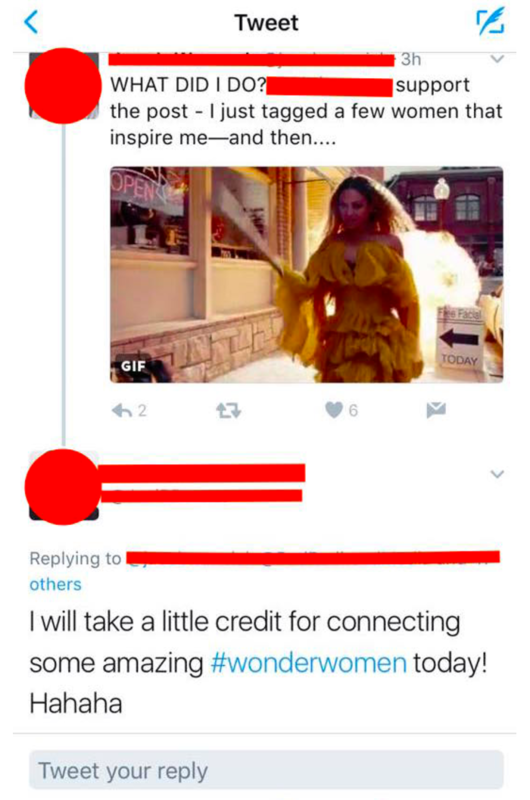 But when men believe they should “take credit” for simply adding to a conversation and connecting women to a cause that has already involved them for many centuries, it can come off as performative. There is a deeper systemic issue here. Men have ultimately been the cause for the gender gap, and many are so deeply ingrained in male privilege that it’s hard for them to understand and be able to sympathize with the physical, social, economic and cultural pressures that women face. Taking credit for doing the bare minimum can sometimes come off as an act of self-praise. It could be considered a form of performative allyship; a way of supporting women with the intention of inflating their own egos, as opposed to actually addressing the deeper systemic issue. And some men (again, not always intentionally) use this allyship to insert themselves in the center of conversations that don’t personally involve them. But what I’m really getting at is that I don’t want this article to be considered an attempt at putting those who are achieving gender equality and racial diversity on a pedestal. Conferences like Mozcon, Call to Action Conference, and the other five events that managed to exceed a 50/50 split are simply doing what they should have been doing in the first place. Think about it: if you had an employee that was simply coasting by and doing the absolute minimum work required of them, would you praise them or give them a raise? No! If anything, you would fire them. So the point here is that by simply sharing a post, or tagging a person on social media, you’re not actually acting towards fixing any issue or making an effort when the important work is required. You’re just doing it to say, “Hey, look! I did a thing today”. So let’s talk about how we can make an actual impact, without coming off as “performers”. An easy place to start is to include more female influencers in any of the round-up articles that you work on. I often get emails from eager content marketers asking me to share their latest “expert tips” article. My response is usually, “I will when you add more women to this post”. If not enough women are applying to speak at your events, research some women and reach out them yourself! 50/50 Pledge: This is a great resource for finding female speakers. Just fill out the form on their site and they will recommend you some great individuals in the industry. CentHerStage: For women who would like to speak but fear they do not have the skills required, CentHerStage offers a keynote speaker bootcamp just for women. 100 Female Influencers: Here’s another list by Shayla Price of 100 influential females in Marketing. A lot of them speak, too! Mic’s List: And again, here is a list by Mic that includes 1000+ female speakers in the tech space. Sometimes we just tend to have a lot of men in our social networks, and that’s ok. But what’s more important is to be reflective of this, and if you notice that you keep ending up at events or meetings that are predominantly male, maybe try making a point to speak up about it, or suggest inviting more women next time. There is also no harm in reaching out to female influencers that you look up to and asking them for introductions. Expanding your network can also help you become a better and more well-rounded marketer and business person, and give you access to a wider range of perspectives. Finally, if you are a conference organizer and notice that women are applying to speak but their content may not necessarily be at the right level, then offer them some feedback or training. Keep in mind that a lot of women simply have not been given the opportunity or the chance to speak at conferences. By helping them understand where they can improve, and by reiterating the importance of practice and rehearsal, you might be really surprised! What is so important when it comes to pushing for equality is that we keep the conversation going. I had a friend, who is a white male, ask me one time if I have ever suffered discrimination based on my gender and my race, and my response was, “Yes! Multiple times”. He was shocked and could not believe it. This is partially what I mean by privileged members of society not being able to fully grasp the nuances and complexity of different forms of discrimination. That being said, I do encourage those who are aware of their privilege to continue working towards sympathizing with individuals who do face discrimination and to help pivot the discussion to a place of inclusivity. The truth is that we are far from a society that completely embraces equal opportunity, and no doubt it will take a very long time to get there. But sometimes the small actions we take can make a relative impact. By pushing towards more diversity in conferences, and giving women the opportunity to be noticed as the influencers they are, we have a chance at shortening the gender gap and inspiring more positive action. Finally, my message to men: you are currently at the top of the pyramid, and therefore you have the power to push for more balanced speaker lineups. Don’t just be a “social media” supporter, instead take action and work towards connecting with more female influencers and helping them get the recognition and opportunity they deserve. My message to women: don’t lose hope and don’t be discouraged when you notice that a conference is extremely male dominated. Be persistent and keep working towards perfecting your craft and polishing your skills as a speaker. Eventually, it will pay off.